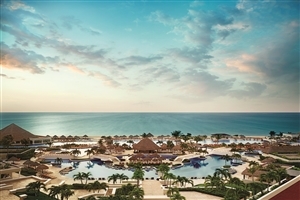 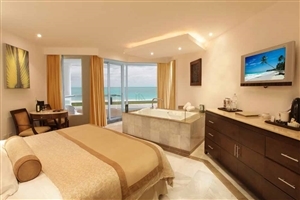 An all-inclusive hotel on the white sands of the east Mexican coast, the Moon Palace Cancun is a glorious location for a breathtaking beach holiday. 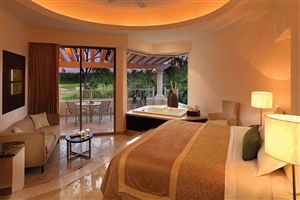 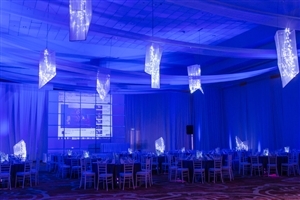 A five-star setting, there are 2,000 rooms set across the 123 acres of tropical gardens. 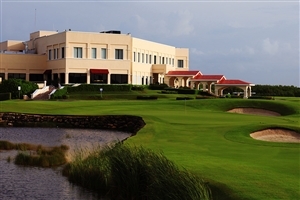 With a golf course designed by American legend Jack Nicklaus, a stunning spa and fantastic facilities for adults and children, this is a great destination for couples and families. 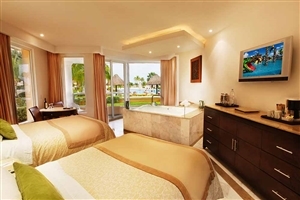 It is a spectacular retreat with everything for a fun-filled, elegant trip on the backdrop of the Caribbean Sea lapping the powder-soft shore. 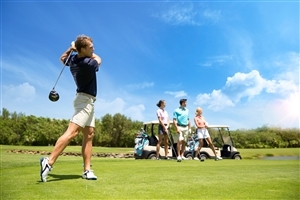 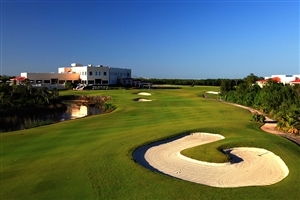 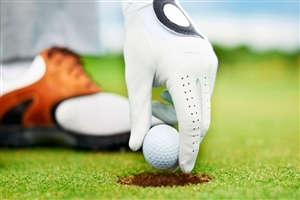 Spend the morning playing 18-holes on the golf course before heading to the beach to soak in the afternoon sun and finishing the day with a game of tennis, there is everything to get the perfect mix of rest and relaxation. 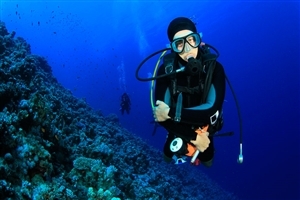 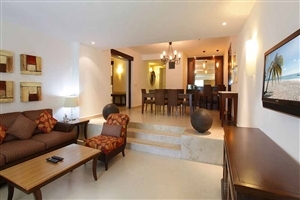 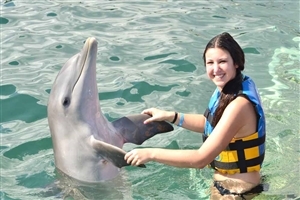 Elsewhere, you can swim with dolphins, use the fitness centre and take excursions to the nearby archaeological sites. 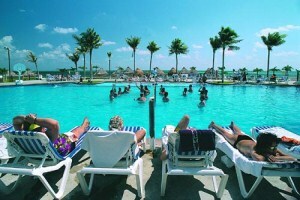 If you want to move at a slower beat then there are swimming pools fringed by sun loungers available across the complex. 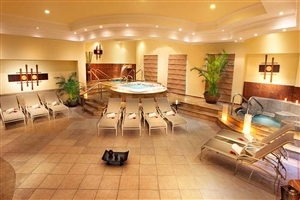 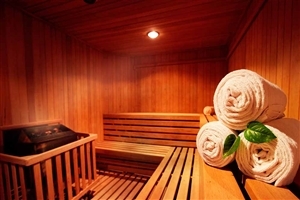 There is also a spa so you can get pampered in luxurious surroundings. 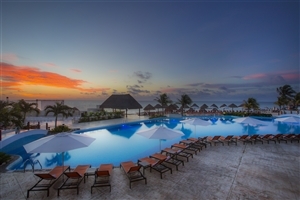 From sunrise to sunset – and into the night – there is something for everyone to enjoy a holiday at the Moon Palace Cancun. 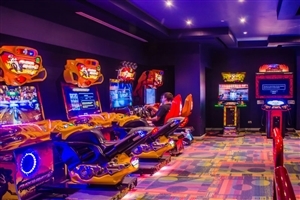 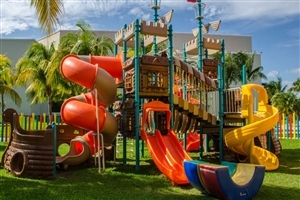 A whole host of activities and amenities means there is always something to look forward to during the day, while the dining and live entertainment brings the evenings to life. 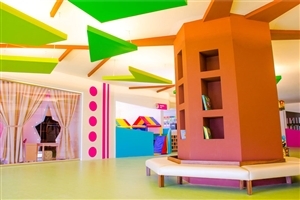 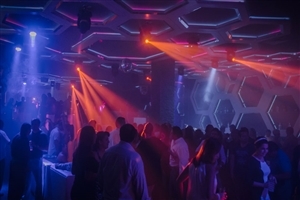 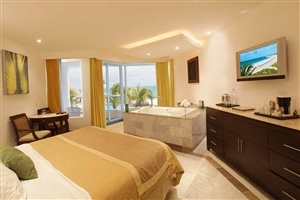 Soft, sun-soaked sands, children’s activities, an expertly designed golf course, a top class spa and a vibrant nightclub, there is something for everyone at the Moon Palace Cancun. 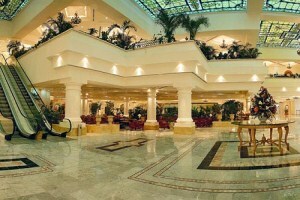 The modern, sprawling complex has more than 2,000 rooms to host their guests from around the world. 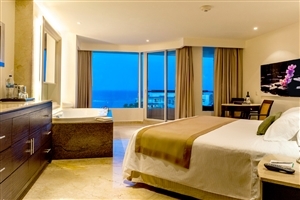 All of these are just a stone’s throw from the fabulous stretch of private beach and the array of facilities and amenities means that it is a great destination for a couples retreat or a family-friendly holiday. 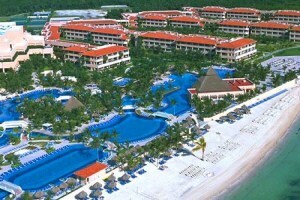 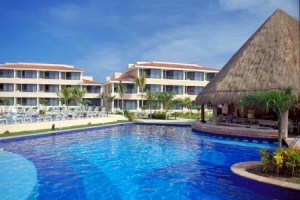 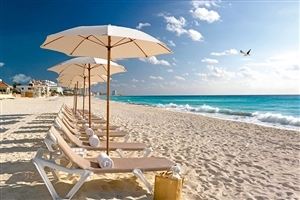 Found on the beautiful Riviera Maya, this is the place to go for your sun-filled holiday to Cancun. 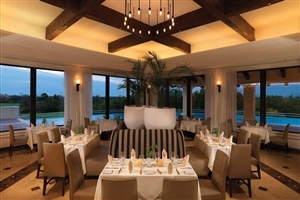 Seven swimming pools, six with swim up bars, are scattered around the resort and the 14 restaurants mean you can vary your meals each evening. 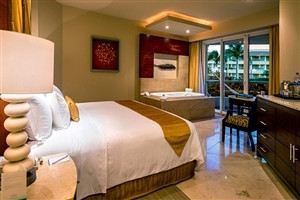 Away from the noisy Cancun strip, you will get a secluded break but you will be able to take various excursions to see the sights of this glorious country. 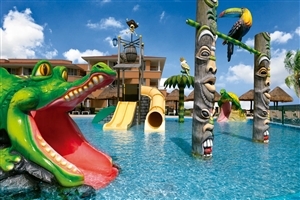 Everything from adventure parks to a world wonder are in shooting distance, so prepare for an adventure amongst this tranquil paradise. 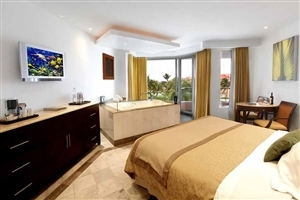 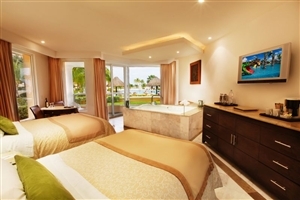 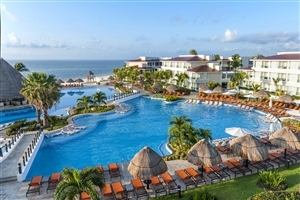 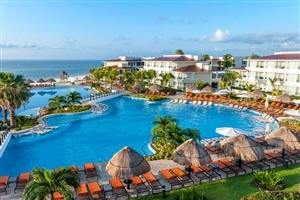 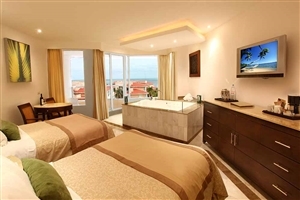 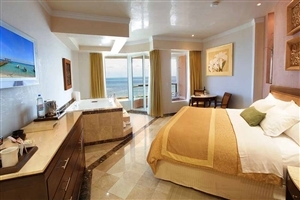 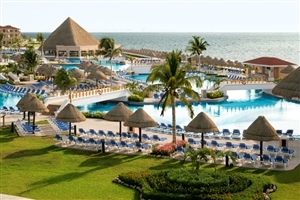 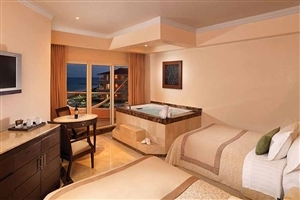 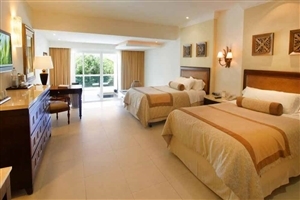 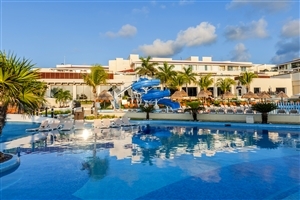 The Moon Palace Cancun caters for all ages and the facilities, along with the welcoming staff and stunning views, make it an incredibly popular choice along the east Mexican coastline. 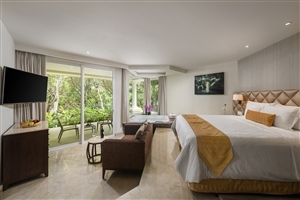 The Deluxe rooms provide guests with accommodation of modern, tasteful design, along with breath-taking views across the resort from their own private balcony. 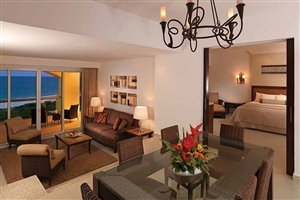 Spacious and equipped with top-of-the-range amenities, The Superior Deluxe rooms boast wonderful views across the resort’s stunning gardens from their own private balconies. 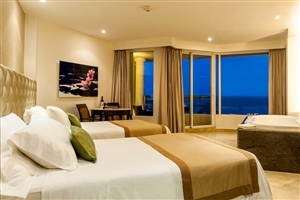 Views across the Caribbean Sea may be enjoyed from The Superior Deluxe Ocean Front room private balconies, while the spacious accommodation is fully equipped with excellent amenities. 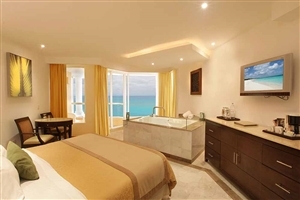 Guaranteed unbroken views of the glittering Caribbean Sea are visible from the private balconies of The Superior Deluxe Ocean View rooms. 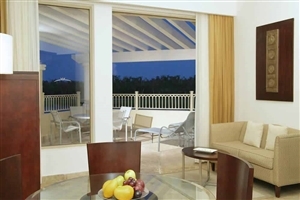 Watch the incredible sunset from the privacy and luxury of your fully outfitted accommodation. 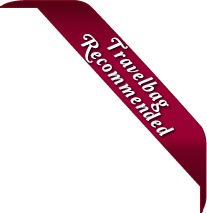 The Concierge Level Room provides treats, such as a DVD player, a professional CHI hairdryer and an exclusive beach bag. 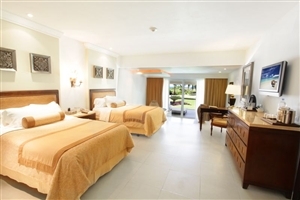 But they aren’t the only things that make this accommodation option special. 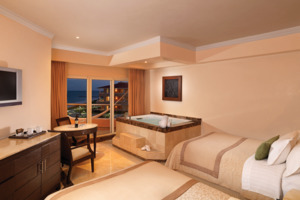 Upgraded L’Occitane bath amenities, complete with couples massage, private beach lounge chair area, intimate candlelight dinner and petit fours each evening, all come as part of the service. 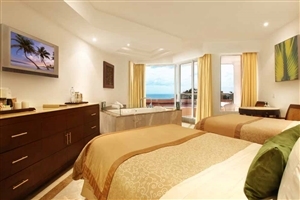 Complete with king-size master bedroom and guest bedroom with double beds, each equipped with their own Jacuzzi tub, The Two Bedroom Presidential Suite is pure luxury. 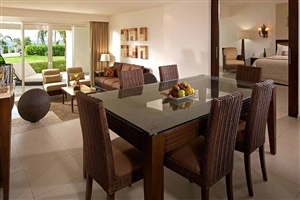 A living room, dining room and half kitchen add to the indulgent feel of this Suite, while views across the Caribbean Sea and the oceanfront allow you to bask in the beauty of the resort’s surroundings. 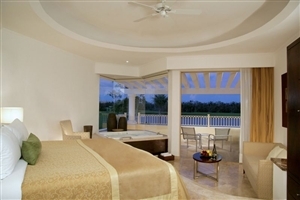 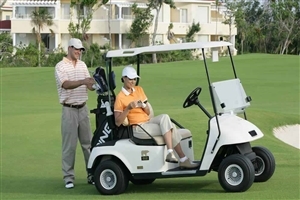 Overlooking the resort’s golf course, with a king-size bed, private sitting area, DVD player and complimentary golf cart, The Junior Suite is ideal for those who are completely in love with golf. 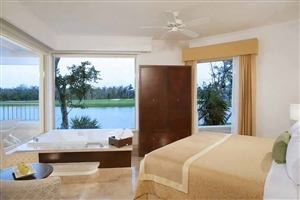 A king-size master bedroom and second bedroom with two double beds make up this fantastic golf-lover’s suite. 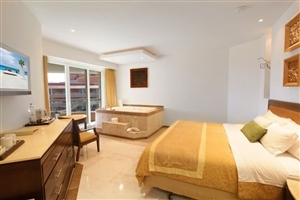 Each room boasts its own Jacuzzi tub, and the suite includes a separate living room and dining room, along with views across the neighbouring golf course. 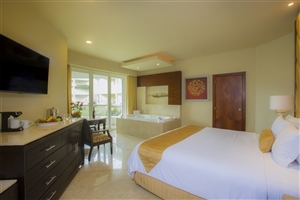 Ideal for larger parties, The Grand Deluxe Suite can accommodate up to four guests and always features one king-size bed or two double beds. 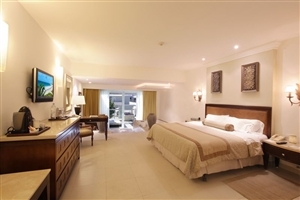 Two interconnecting Superior Deluxe rooms provide more than enough accommodation space for up to 6 guests. 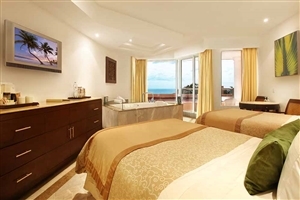 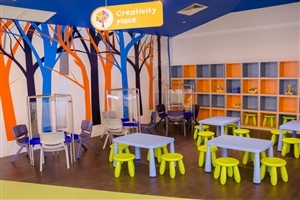 The Family Deluxe rooms are ideal for families with children, and feature added benefits such as welcome amenities for families, an Xbox games console, a DVD player, L’Oreal Kids products and a Fun in the Sun Bucket kit. 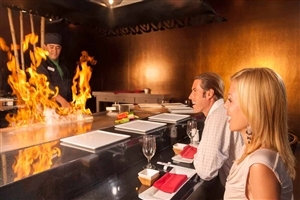 There is a plethora of dining options awaiting you at this all-inclusive resort, with plenty of dishes to make each night taste different. 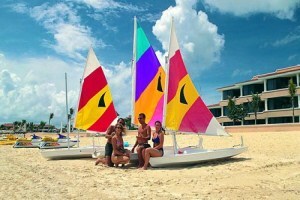 After this, the bars and nightclub are available to enjoy the starlit evenings. 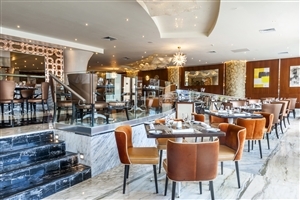 El Manglar – Perfect to fill you up throughout the day, this venue offers an international buffet that serves breakfast, lunch and dinner. 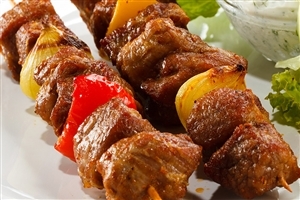 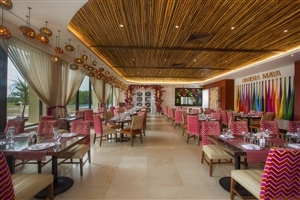 Arrecifes – Also available throughout the day, this eatery gives you Mexican and Brazilian dishes. 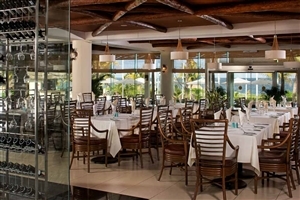 Los Caporales – A popular a la carte restaurant that serves Mexican cuisine. 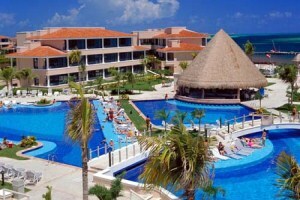 Palapa Pelicanos – A restaurant with two faces. 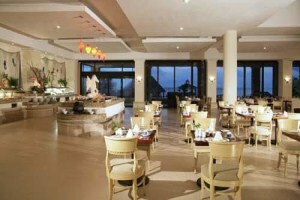 By day it is an international buffet but come the evening it transform into an a la carte sushi location. 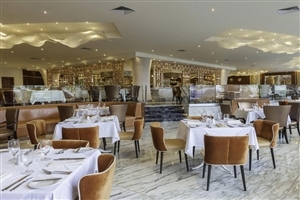 La Gondola – Open at breakfast and dinner, La Gondola is a buffet serving Italian dishes. 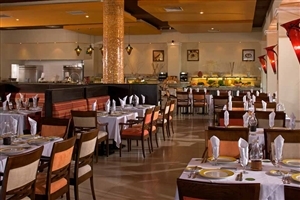 Bugambilias – Mexican cuisine buffet-style throughout the day. 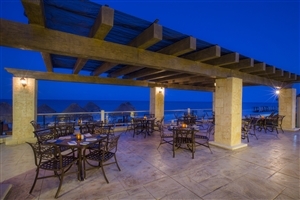 Palapa Barracuda – A buffet at breakfast and lunch, it becomes an a la carte steak house in the evenings. 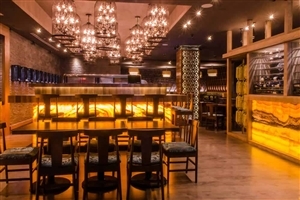 Momo – The perfect place for dinner if you like Asian dishes. 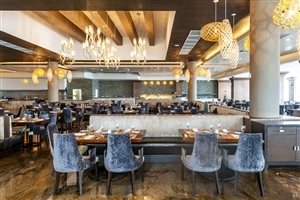 Los Tacos – Exactly what it says, it serves Mexican tacos throughout the afternoon. 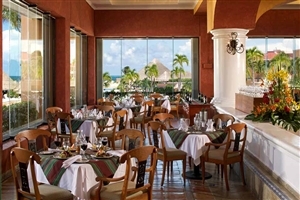 El Caribeno – A breakfast and lunch buffet that becomes an a la carte Caribbean restaurant in the evenings. 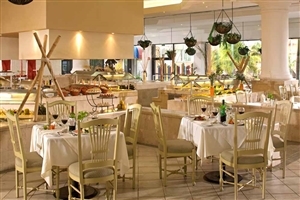 La Trattoria – Exclusive Italian restaurant in the evenings that is a buffet during the day. 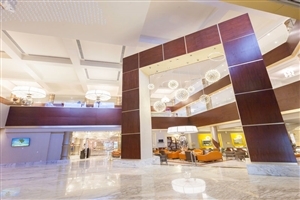 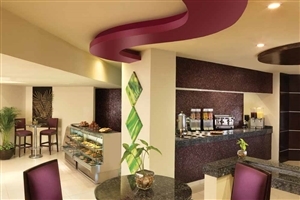 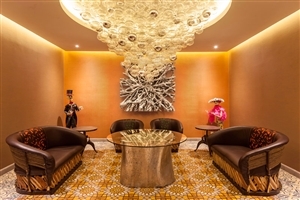 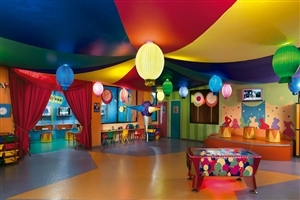 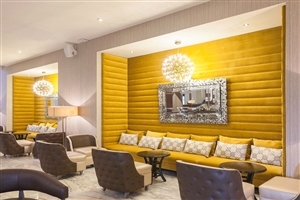 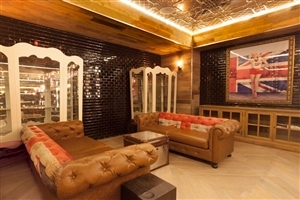 Lobby Bar – Enjoy live entertainment and plenty of refreshments in this relaxing bar. 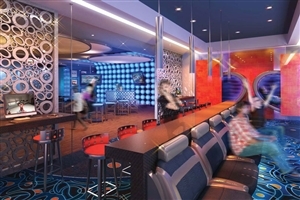 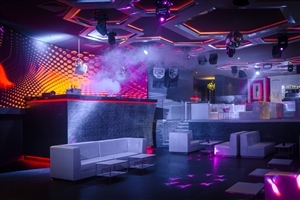 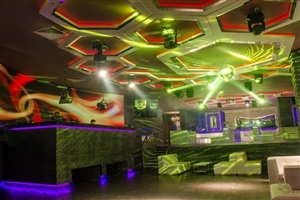 Lounge Bar – Offering snacks and sushi, this bar has live music daily. 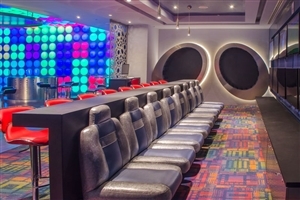 Sky Bar – When night falls, this is your cocktail bar. 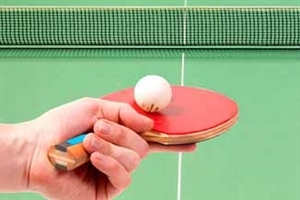 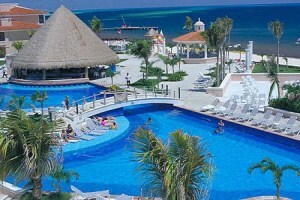 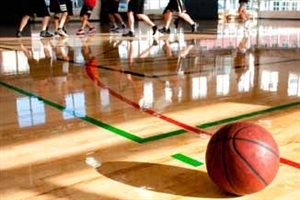 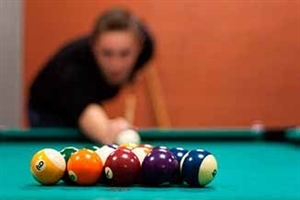 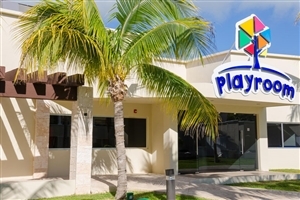 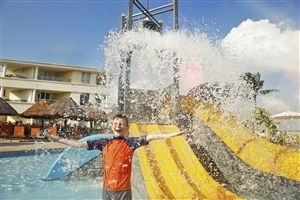 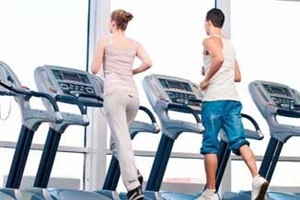 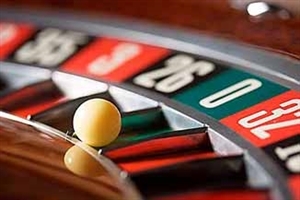 A myriad of activities are available at the Moon Palace Cancun to entertain everyone every day. 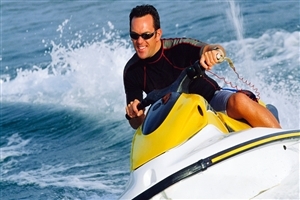 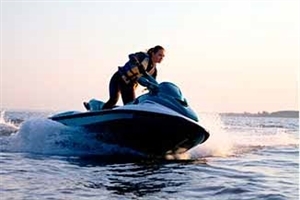 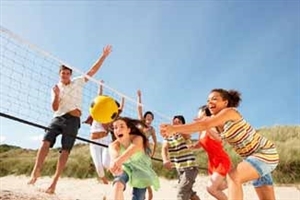 Great entertainment and top day trips give you a reason to leave the soft sands for a few hours.